I visited Chiapas multiple times over the years and I’ve always been careful about taking pictures of people as people’s attitudes to cameras vary from region to region, or even village to village. They are often wary. On this occasion, though, it was this girl’s mother who insisted I take her picture. Puzzled, I tried to inquire why. Conversation was difficult as the women in these remote villages spoke very little Spanish, not to say anything about my linguistic inadequacies in Spanish. With the help of children who seemed to switch easily between Mayan languages of Tzoltil, Tzeltal, Tojolobal (as that particular area was at multilingual crossroads) and Spanish, she explained to me that she wanted for there to exist pictures of her children who grew before her eyes. It wasn’t just that there was no running water or electricity in this village. There were also no cameras. Time was reduced to its essence: ephemeral and passing. I did quickly ponder the ethics of the situation, and my own role in introducing new technologies, but quickly decided that I was in no position for any pretentious pondering of the “prime directive.” She wanted pictures of her children. I clicked on the shutter. Fast forward just a little more than a decade, and we it seems we have cameras everywhere. Everywhere. Youtube’s “news director” Olivia Ma once told me that within about an hour of something of some importance happening anywhere in the world, Youtube has video of it uploaded. It is striking enough that Youtube has a news director. It’s stunning that videos of almost all events appear on Youtube within such a short time. In fact, correctly put, it would not be incorrect to say that Youtube is probably the biggest news site in the world–and that fact is often overlooked because there is also so much else on the site. Sometimes, it can take a while for a significant video to be discovered and no doubt that some never are beyond a small audience but there is almost always something, however shaky and grainy. This is nothing short of a revolution in surveillance capacity of citizenry. One may wish that stoning death of Yazidi Kurdish young girl Du’a Khalil Aswad in 2007 was never discovered on Youtube, but that seems so trivial compared to wishing that she was never killed in such a cruel, brutal fashion. She was, though, for the alleged crime of seeing a boy of a different faith. She was murdered somewhere early in April 2007 and the video of her awful death started circulating widely later that month. A few weeks after her killing, and a few months after the video was discovered and eventually made headlines around the world, a series of bombings shook Yazidi villages near Mosul, resulting in about 800 deaths and more than 1,500 injured—making it the single biggest episode of mass killing in an act of political violence since September 11, 2001. While the culprits were never discovered, most observers traced the events to the tensions that began with the video of her death. The fact that the event was filmed and uploaded to the Internet is quite striking, too, considering the community. The Yazidis are a mostly Kurdish speaking religious group in the Middle East who keep to themselves as much as they can. The reasons for their protectiveness is lengthy and complicated but is related to the fact that a central figure in their faith, Melek Taus is accused of being identical to the Muslim figure of Satan. Having faced much prosecution, and also having a contentious faith in a contentious region, Yazidi society is predicated upon keeping outsiders out and practices strict endogamy—no marriage with outsiders. Du’a Khalil, just 17 years old, crossed just that line with her alleged relationship with, and rumored conversion to Islam. For that, she was dragged to the street by a few dozen men who proceeded to beat her to death as she curled up on the ground, bleeding. The shaky and grainy video, which I saw in bits over the space of a few days as I could not bear to watch in in a single sitting, shows at least *three*other people recording her stoning with cell phones. It is quite stunning to think—not only are they killing her –this secretive, closed society which managed to survive for thousands of years by being so guarded and cautious— her killers felt like they should film this. Not one of them but at least four. And, more, upload it to the Internet. Below, I’ve included the same stills from her death that Wikipedia has; the video is harrowing. I’ve been thinking about that incident as I’m recently thinking a lot about what it means to have so much video of horrific death and destruction out of Syria. Indeed, as one journalist I spoke with put it, we are literally watching a war on civilians being live-streamed. Despite all efforts by the Syrian regime, it is quite clear that this is not censorable or stoppable. The combination of cheap and small satellite modems and a fairly dispersed uprising has meant that there is truly no real way for the government to shut this down. The Syrian uprising will be live-streamed. I have more questions than answers. What does it mean that everything –including the most trivial but especially the non-trivial– has such a great chance of being available worldwide? Starting with the printing press, the threshold for the ability to publish has been getting lower, and the potential reach of publications has been getting bigger. We are now at the level of the person, publishing at the level of the world. The publishing revolution is almost complete. Does this level of documentation make it more likely that the international community will be compelled to react to atrocities–which will likely come with higher and higher levels of visibility? Or will this, too, become just background noise, similar to famines or disease in Africa have become for most of the world (except the victims, of course)? Does the level of documentation and surveillance –and thus, evidence– make it harder to establish processes like the Truth and Reconciliation efforts in places ranging from South Africa to Guatemala? Will this amount of documentation of atrocities make divisions even more likely and pernicious–as the ability to forgive often needs some level of forgetting? And the Internet, it seems, does not forget. Will this all make regime bureaucrats more likely to defect—as “I was just pushing paper and had no idea all this was going on” has become an even weaker defense? Or will they cling to power to the very end as much as they can, knowing their victims and survivors have much evidence as well as awful reminders of their crimes? I don’t have the answers but I’m quite convinced that we’ve entered an irreversible point in terms of documentation of our lives, including death and destruction—not just baby pictures and trips, parties and graduations but also shelling of towns and killing of children. There is no going back. And tools matter. Just as wars with nuclear weapons are different than wars with bows and arrows, a world with cell-phone cameras in every other hand is different than a world which depended on traditional journalists and mass media gate-keepers for its news. I want to emphasize that I am not making the argument that we, as humans, are drastically different in terms of our urge to document. In fact, I find such approaches to technology to be without support. Most of the time, the remarkable changes from technology come not because people suddenly start having new and unprecedented urges but rather because people continue to practice their mundane and human urges—but under drastically different conditions. The difference is not in human nature but in the socio-technical architecture. So, it seems, with our urge to capture out lies. The speed which we have taken this up clearly means we must have always had the itch to document, to surveill, and to display and share. But now we can scratch and scratch and scratch–and share on a global scale with a click. 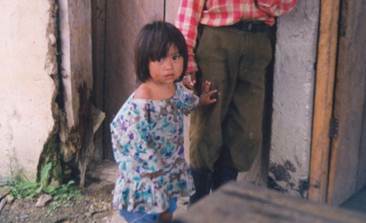 I left my camera with that mother in Chiapas and have never gone back to that exact village to find out what has happened. It’s quite possible that not much has changed. Women are probably still painstakingly grinding the corn by hand, and children probably still go out at dawn to collect firewood from the dwindling surrounding forest for the stone tortilla ovens. There probably still isn’t a doctor within a reasonable walking distance of a day or so. I am quite sure, however, that there would be at least a few cell phones with cameras in that village–as there are now in villages around the world, from Africa to rural India. And as more and more of those cell phones come with basic audio-visual capabilities, the surveillance revolution is here to stay. And I hope that little girl –probably a teenager now– is doing well, and I hope her mother has a few pictures of her as a toddler and as a young child to remind her of the days gone by. But I mostly hope that their future is even better. * PS. 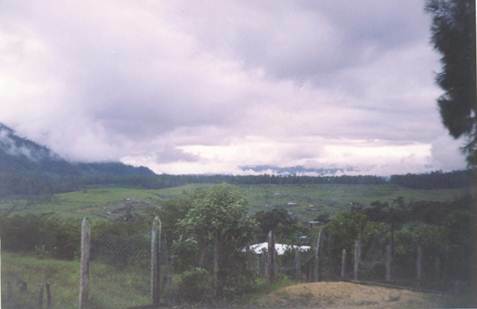 The extraordinary thing about the Zapatistas and the Internet was not that the Zapatistas were that much different (or “postmodern” as commonly claimed)–in fact, they were a quite ordinary Latin American peasant uprisings in many respects. However, their insurrection took place in a world where the Internet was emerging as a powerful tool for political communication–and that did make a big difference. That topic deserves a post of its own so I’ll leave it there. *** PPS. The date typo confused a few people. I was not there in the early days of the uprising –followed it closely, but from a distance–. Rather, I traveled there later multiple times while the unrest was ongoing. This entry was posted in Uncategorized on February 20, 2012 by zeynep. All these examples of how the online interacts with offline are clear example of why questions like “face-to-face or online friendship?” or “was online or offline more important in the Arab spring?” are not fruitful. The answer is yes. Because there is no “virtual” world separate from this world. As Nathan Jurgenson, who often writes about “digital dualism”, puts it the correct model to understand the Internet is not that the Internet is the “Matrix” and this world is “Zion” a la the movie Matrix. The world is one. However, that one world is not the same one as the world before the Internet. What’s analytically and politically important is that the online is NOT the same as the offline, not that online and offline are somehow two separate planets. Bits and atoms have different properties and their current integration creates many novel configurations we have not yet adapted to as societies. Bits are easy to copy while preserving their full organization, atoms are not (in other words, in the online world we have whatever Scotty in Star Trek used to beam people up by deconstituting them molecule by molecule and reassembling them someplace else. (Oops, if you are in an industry where your product is in bit form). Bits travel much easier than atoms, making bits much harder to censor and isolate (I’m looking at you, Mubarak). The architecture in the online world depends on the underlying code while the architecture of the offline world depends on laws of physics. Hence, online, we don’t have the same balance of privacy and visibility that come from the physical properties of space and time: that offline speech disappears after it is uttered; that, offline, we can usually see who is looking at us; offline walls, doors, locks and windows operate in a predictable manner. (That is why Facebook can be so jarring at times: it often ignores deeply ingrained cultural conventions based on laws of physics. It puts all your friends in the same room, by default–and its new timeline defies rules of flow of time as we knew it). This lack of dualism applies to other technologies which separate the person from their words (which is the nexus of what Plato was vehemently objecting to when he decried the invention of writing and hence the separation of the human from their utterances. That critique is not invalid and remains applicable). When I was a child in Turkey in the pre-Internet era, I would have running conversations in my head with my favorite authors. These authors were quasi-people in my life because I had a void in my personal world. It’s not that I was asocial, on the contrary. 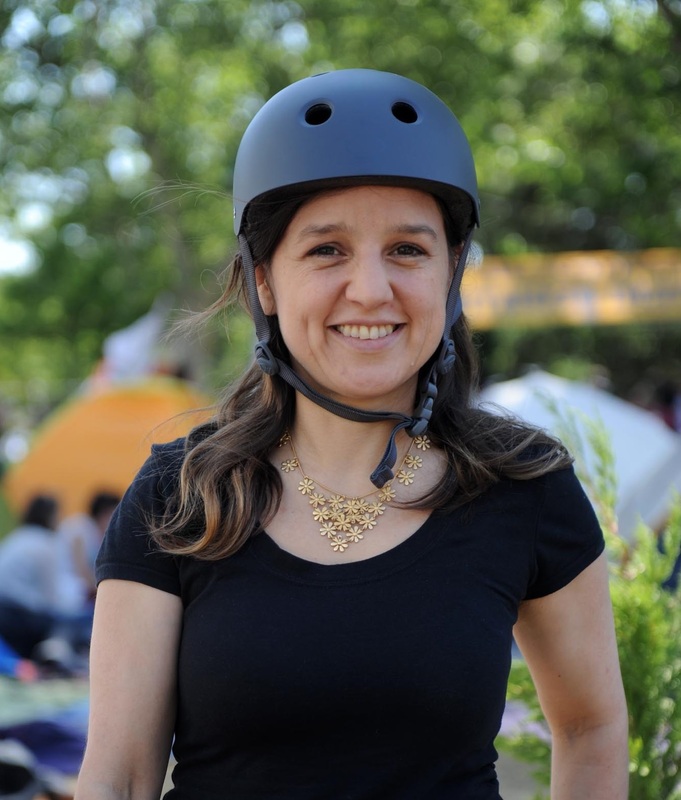 I had many friends and I played in the streets and did all the kid things –and enjoyed them– but I also had a deep interest in topics that I was unable to find anyone around me to talk with in person (I suspect this is not an uncommon experience). So, I’d go for walks and have conversations in my head. With authors. Whom I’d never met and probably would never meet. These days I meet people sometimes first online, sometimes first offline, but almost always have interactions that span both modalities. When a friend recently told me (online) that he was going on a pretty amazing trip, my first reaction was “how cool.” My second reaction was, “um, heck, does this mean I can’t email you with my random thoughts on stuff we’d been talking about?” Connectivity has become augmented and for me and the deeper divide has become not whether or not connectivity is online or offline, but whether there is some kind of connectivity or not. There is certainly a difference between emailing someone and, say, sitting in a cafe by the Bosphorus; however, I am not able to categorize it merely as one is good/the other is bad. Each form has strengths and weaknesses depending on the topic, person, location, moment… Some things are better discussed over email. But sometimes you need to be able to hold out a hand. And as Carr mentions in reference to my work, interaction is one of the key mechanisms through which ties can strengthen or weaken–and certainly accessibility through online interaction is part of this mix. In fact, ubiquity of online platforms might increase the isolation of those who either through choice, disposition, or opportunity are not willing or able to be part of mediated, digital sociality and hence create a third level of “social” digital divide. (First level being basic access and second level being skill). You might think my own experience is unique (and as a traveling academic I am certainly not typical), and Carr is also not typical. But recent survey findings reveal that ordinary people are also increasingly establishing “migratory” friendships–In two separate studies, about 20 to 25% of respondents report friendships which begin online and migrate offline (Wang and Wellman 2010; Gennaro and Dutton 2007) so this is certainly not the exclusive domain of the digerati. The fact of online and offline augment, rather than categorically oppose, does not change the fact that there is something deeply human and imitable about in-person interaction. Babies, even when a few days old, respond to a human smile differently than a non-smiling human, and distinguish between a representation of a face and a shape that has elements of a face but is not arranged like one. To this day, one of my greatest regrets is that I never managed to meet in person with one of the authors with whom I had these deep, personal but internal conversations, Edita Morris, and tell her she changed my life. She was alive when I read her book but died a few years after. By exposing me to the existential horror that can be brought about by scientific knowledge, something I had not considered before, her novels about the aftermath of the atom bombs started me away from the path of the child driven by scientific curiosity and one who wanted to be a scientist herself to who I am as an an adult–a person who wants to understand and help shape how science and technology interact with our world. If I had the Internet then, I could have at least emailed her. This entry was posted in Uncategorized on February 8, 2012 by zeynep. As I read this essay on “The Death of the Cyberflâneur” by Evgeny Morozov who argues that the Internet lost its early quality of leisurely strolling and encountering the unexpected, I kept thinking about how this did not fit my experience. While there are many parts to Morozov’s essay –some of which I am not going to discuss here at all– I want to focus on the idea of “wandering around” the Web and encountering the unplanned in light of the emergence of the “social web”. For me, the social web has greatly increased exactly this quality of the Internet –encountering the unsearched and the unplanned– and I don’t believe this is because I am exceptional but rather it is because connectivity through people –the social web– yields more diverse and surprising encounters than mere connectivity through topics or information-the early Internet. Something similar has happened to the Internet. Transcending its original playful identity, it’s no longer a place for strolling — it’s a place for getting things done. Hardly anyone “surfs” the Web anymore. The popularity of the “app paradigm,” whereby dedicated mobile and tablet applications help us accomplish what we want without ever opening the browser or visiting the rest of the Internet, has made cyberflânerie less likely. First let’s get some numbers out of the way. Is it true that “hardly anyone “surfs” the Web anymore”? In a recent (December 2011) and nationally representative survey, Pew Internet found that 74% of all online adults answered “yes” to the question if they do go online for “no particular reason except to have fun or to pass the time.” I don’t think this is blip. In my 2010 surveys with college students a whopping 77.9% said “very often” when asked how often they went online “for no reason at all”—and I’ve probed this question many times since 2005 and I have similar numbers for all the years. This is the very stance that is killing cyberflânerie: the whole point of the flâneur’s wanderings is that he does not know what he cares about. … Compared with Facebook’s highly deterministic universe, even Microsoft’s unimaginative slogan from the 1990s — “Where do you want to go today?” — sounds excitingly subversive. Who asks that silly question in the age of Facebook? I have to say that at face value, this is an attractive argument, and one that has been echoed by others: the “filter bubble” or the “daily me”—and indeed raises deep questions about how to design for serendipity:to find not merely what we are looking for, but to wander and to stumble upon things a la the flâneur, to encounter the unexpected, to savor the surprise. However, in my personal experience, platforms like Facebook and Twitter have greatly increased the amount of unplanned and interesting information I encounter exactly because they are person-to-person spaces rather than information-spaces. Online, I interact with people with whom I share at least one strong interest–but thanks to the social Internet, I am not exposed to just that limited topic but the much wider universe of what my friends share. And this is always much broader than the narrower affinity that first connected me with that particular person. The trick to understanding this effect is to understand that people’s affinities don’t lump neatly, nor do they ever overlap completely. In other words, we are, fortunately, not clones of each other. Stereotypes work as broad generalizations at the aggregate, statistical level but break down spectacularly at the individual level: show me a stereotypical “X”, and I’ll show you traits he/she does not share with other stereotypical “X”s. For example, I have strong interests in social impacts of technology, human rights and democracy and the Middle East–and often make friends based on that basis. However, I have other strong interests which do not fit into any of those categories—and, crucially, so do my friends. Social media thus exposes me to other interests of my friends, and exposes my friends to other interests of mine—and I am surprised everyday by the richness and diversity of these encounters. A friend I met because of shared interest in the emergence of the Internet and the Middle East may pleasantly introduce me to a music genre I dabbled in but never had the time and expertise to dive into. From another, I encounter the intricacies of representing light on metallic surfaces on oil paintings. Somebody shares an article on how bilingualism changes the brain. Baby pictures, sunsets and cat videos, of course, also pass through my stream. But along musings on nature parks in Latin America. There is a new restaurant in town—well, in a town I’ve never been to. It goes on and on and on in a great deal of richness, diversity and complexity. In fact, encountering things I did not explicitly care about happens to me significantly more than the days I had to click-click-click my way around “cyberspace” because as much as I thought I wandered around, I could never wander around within the richness and depth of my encounters through the social web. At this point, you might say that I have interesting friends and that is an anomaly. Perhaps, but that is not the point. The point is that I have friends who are not clones of me but have enough similarity with me that they introduce me to topics that I did not know I was interested in, but may plausibly be, if it just popped in front of me. This is likely true for most people for structural reasons. Crucially, my online encounters introduce me to spaces that are both adjacent to (interests of people somewhat like me) but also far (not my interests) from me. In the old days of seeking by information, I was more likely to encounter only information I was seeking (Duh) but not manage to get too far unless I truly started clicking randomly–but how do you do that? Search for “random”? In the new era of connecting to people, I am exposed to a lot more because “people” are a lot broader than “categories of information” which are, by definition, narrow. To put an empirical point on this, look at this striking finding from the latest February 2012 Pew survey. It is commonly the case in people’s offline social networks that a friend of a friend is your friend, too. But on Facebook this is the exception, not the rule. A fully connected list of friends on Facebook would have a density of 1 (everyone knows everyone else). The average Facebook user in our sample had a friends list that is sparsely connected. As an example, if you were the average Facebook user from our sample with 245 friends, there are 29,890 possible friendship ties among those in your network. For the average user with 245 friends, 12% of the maximum 29,890 friendship linkages exist between friends. For those of us familiar with research on this topic, this number, 12%, is very striking. Most of the time, it is fairly safe to assume that a person’s friends form “close triads”—people you know also know each other–and this creates a structure that looks like a triangle: everyone is connected to everyone else. What this 12% number is saying is that on Facebook, your Facebook friends are almost never friends with each other, i.e. 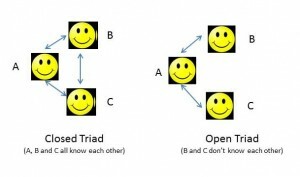 rather than triangles, they form “open triads”. 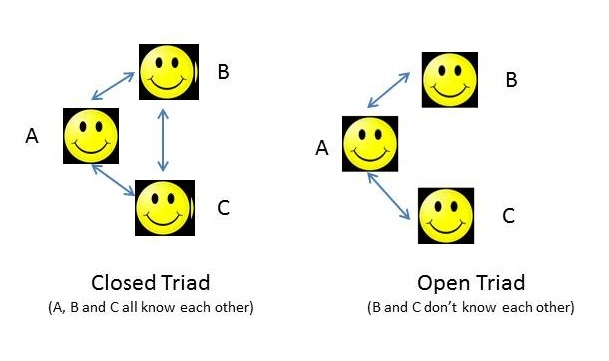 People in closed triads tend to be more similar each other either due to origins of the connection (living in the same environment) or due to convergent homophily (people exposing/converting each other through multiple encounters over time). Although we’re more likely to share information from our close friends, we still share stuff from our weak ties—and the links from those weak ties are the most novel links on the network. Those links from our weak ties, that is, are most likely to point to information that you would not have shared if you hadn’t seen it on Facebook. The links from your close ties, meanwhile, more likely contain information you would have seen elsewhere if a friend hadn’t posted it. In other words, platforms like Facebook connect you with people who connect you with information you simply would not have encountered yourself—and these connections happen especially through your weaker ties who, structurally speaking, are more likely to be in open triads with your other friends, i.e not friends of your their friends. I suspect this may be even truer for Twitter. I don’t deny there is something to the argument that the shift to walled gardens comes with particular threats, but I disagree that the shift to the social Internet kills diversity, surprise, or richness. An Internet that is collection of sites which brings together, say, “people interested in model airplanes to talk about model airplanes” is going to be a lot less likely to expose us to the unexpected than the social Internet which connects us to people in their fuller richness. It is not the Internet of things, or Internet of information, which keeps the Web brimming with the unexpected: it’s the Internet of people. Sometimes nothing is a more surprising and complex bundle of the unexpected as another human being. This entry was posted in Uncategorized on February 6, 2012 by zeynep.